Young galaxies typically go through a period of rapid star production. For example, dusty starburst galaxies produce stars so rapidly that it would consume all of its gas and dust in about 10 million years at that rate. But before that early star production period, a galaxy also has a period of rapid formation into a galaxy. In this period the central black hole of the galaxy is particularly active. As a result these galaxies are bright in the infrared, and are known as luminous infrared galaxies (LIRGs). Recently, analysis of data from the WISE infrared satellite has found dozens of LIRGs, including the brightest galaxy ever discovered, known as WISE J224607.57-052635.0. 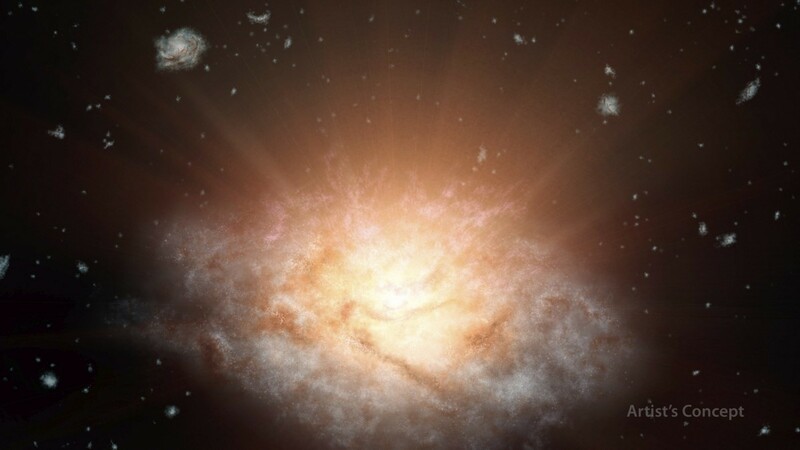 The light from this particular galaxy has traveled for about 12.5 billion years, which means it comes from a time when the universe was only 1.3 billion years old. It has a luminosity equivalent to 350 trillion Suns, which is surprising since it is smaller than our own Milky Way. The reason it is so bright in the infrared is that it is surrounded by a halo of gas and dust. As the central black hole gorges itself it emits light at a range of wavelengths from x-rays to ultraviolet. Most of that light is absorbed by the surrounding halo, which is heated by the light and emits infrared. But given just how bright this galaxy is, the central black hole must be consuming matter at a prodigious rate. So much that it would exceed a theoretical limit known as the Eddington limit. Basically as a black hole consumes matter the light it emits should push back against infalling matter, thus limiting how much can be captured. There are ways that the Eddington limit can be bypassed, but the fact that this would occur in a young galaxy indicates that supermassive black holes in the centers of galaxies may have formed earlier and faster than we once supposed.